Stenter Machine Pin Plate Manufacturer, Textile Machinery Manufacturer. We have been in manufacturing also, are a worldwide exporter and supplier of Pin Plates for all types of Stenter Frames. Genuine and premium quality of Pin Plates for Stenter Machine. 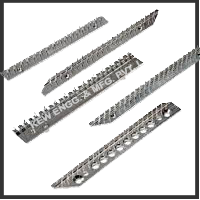 The high quality raw material used in the Pin Plates has made our Plates more durable for high performance. All type of Bow Roll Manufacturer on desired size and length.